Adaptee: An interface or an abstract class that has legacy methods which are not compatible with the client. The stand point of the pattern is to work the clients with the incompatible interfaces by not chancing or enhancing the methods of the adaptee via the Adapter classes/interfaces. On the other hand also Adapters known as a Wrapper classes. Furthermore, the adapter pattern also practices the Open Close principle in the S.O.L.I.D. in a way that we will not change the existing code unit that will be closed, however we will wrap it by using an adapter. In the real world examples you will see US/Europe electricity socket voltage adapters and all in one memory card, card reader a computer and so on. However, the Adapter pattern does neither of those, but provides a way to the client to work with an incompatible interface by either encapsulating the logic or delegating it. Observe the following to apprehend the topic. 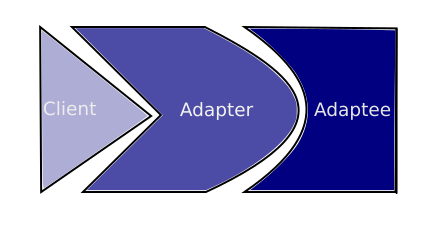 The adapter class utilizes Composition. The adapter has an instance of the Adaptee interface/abstract class and delegates the request to it. For the sake of the simplicity, I’ll emphasis on an old main frame that needs an adapter for classes that work on the Strings with tabs after each enter. Main: It is used as a client and expose the capabilities of the each adapter implementation.